Just a few years ago, or even less, if some one would have said “I’m working with a Google framework and a lot of open source plugins – in Visual Studio“, the instant reply would probably have been slightly Pythonesque, like -“He’s a witch, burn him!!!”. But what once might have been considered an unholy trifecta is now not only doable, but it’s even enjoyable. The last few days I have been thinking about how to set up the styling of my Polymer elements in an easy way that would help me keep the CSS dry, preferably by use of variables, linked files and mixins. At the same time the tooling had to produce my desired file/folder structure and be usable from VS2015. The solution also had to be generic enough, install and setup once with no need for changes when adding new elements and stylesheets. What I came up with was Sass run with Grunt, and here is the steps needed to set it up in Visual Studio. First off, to be able to run Sass you need to install Ruby, as Sass is a Ruby gem. This is a hack so don’t use this as a constant solution! But after this, installing Sass with Chocolatey worked fine. 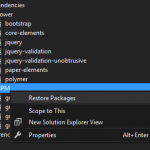 Now it’s time to set up the tooling in Visual Studio. 1. 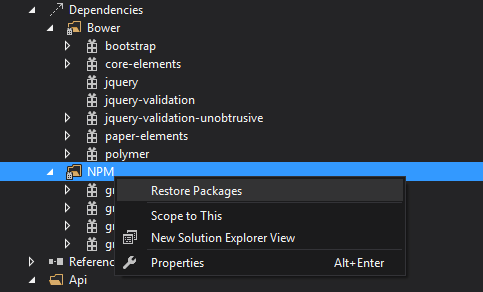 Add “grunt-contrib-sass” to package.json, right click the NPM folder under Dependencies and choose “Restore Packages”. Expand thumbnail for visual description. 2. Configure Grunt by editing the gruntfile.js. This is all the setup needed in Visual Studio 2015 to enable you to run Sass from the Task Runner Explorer. Process terminated with code 6.  Use --force to continue. In my case “C:\ruby215” is where Ruby was installed, this needs to be changed if your path is different! Both lines should report the current installed version, if everything is setup correctly. Trying to re-run the Sass task from Visual Studio now will result in the same problem as before, it’s telling us that Ruby and Sass needs to be on the path. But that’s because it’s keeping the state of the path since it was loaded, so just restart VS2015 and it will pick up the new path. Running the task after restart will now result in a successful run, given everything is setup properly. For more information about how to setup grunt tasks with dynamic file objects – see the documentation for Grunt. Would you be willing to help me with the other pars as well?